One of the greatest composers who ever lived, Bach was the musical culmination of the Baroque Era. Astounding as it may seem, he was not famous for his musical compositions during his lifetime. Like Cesar Franck he was considered only a church organist, and it wasn't until a hundred-years after his death that the world began to realize what Bach really was. His sons had achieved a greater fame than the master. 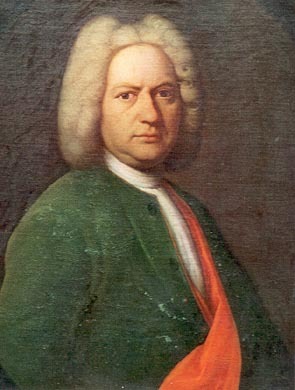 Bach was born in Leipzig, Germany in 1685. He became an orphan early in his life...both his parents having died when he was 10. His father had begun to teach the young Johann the violin and he went to the home of his brother to receive lessons on the clavichord. His brother, however, forbade him to inspect a manuscript of works by Frohberger, Buxtehude and other composers. Obtaining it secretly, Johann copied it by the moonlight for 6 months. At 15, his fine soprano voice secured him free tuition at St. Michaels Church in Luneberg. He went on foot on holidays to Hamburg to hear the great Dutch organist Reinken, and at Celle he heard the French instrumental music that was used in the Royal Chapel. Bach also studied the work of Bohm, organist at Luneberg, and practiced the violin, clavichord, and organ... often all night long. In 1703, he joined the Weimar court orchestra. In 1704, he became organist at Arnstadt, and in 1705 he walked fifty miles to Lubeck to hear Buxtehude. He stayed there until he received a peremptory recall from the Church at Arnstadt. In 1707, he became the organist at Muhlhausen. On October 17, he married Maria Barbara Bach, his cousin, who bore him 7 children, of whom four died, leaving a daughter and two sons who later became more famous than he ever dreamed of being. In 1708, he played before the Duke at Weimar and was made the court organist. In 1714, he furnished the organ music for a service that was conducted in the Thomaskirche in Leipzig and also produced a cantata. In Dresden in 1717, he challenged Marchand, a French organist of high repute, but Marchand was afraid to compete. Bach was a brilliant performer. In 1717, he became Kapellmeister to Prince Leopold of Anhalt at Kothen, and composed much orchestral and chamber music there. In 1719, he revisited Halle to meet Handel, but unfortunately, Handel had just left for his new home in England. In 1721, Bach married Anna Magdalene Wulken who bore him 13 children, 9 of them sons, of whom only 2 survived him. May of 1723, he became the cantor at the Thomasschule in Leipzig and also the organist and director of music at the Thomaskirche and the Nicolaikirche, continuting as Kapellmeister vom Haus aus to Prince Leopold. By this time, Bach had established a reputation as a great organist. In 1736, he was made the honorary conductor to the Duke of Weissenfels and court composer to the King of Poland and Elector of Saxony. He held this position at Leipzig for 27 years and there, he wrote most of his sacred music. When Bach died in 1750, he was little known as a composer and very few of his works had ever been published. In 1829, Mendelssohn took up Bach's cause and introduced his music to Europe with a performance of the St. Matthew Passion. In 1850, a hundred-years after his death, the Bach-Gesellschaft, in which Brahms participated, began to publish the enormous complete works, and this was completed many years latter.